To ensure we are meeting learners' needs and that they are making progress it is important that we are conducting regular assessment. Summative assessment is a useful and powerful tool, providing a milestone in a student's progress that is evidence of their progress and what they need to do to progress further. However, if we rely on this alone both teachers and students will remain unclear about the progress being made until that point; unaware if more assistance is required or if the goals have already been met. Continuous assessment is about the assessment strategies that we use in every lesson to find out where our pupils are and to plan our responses to them. 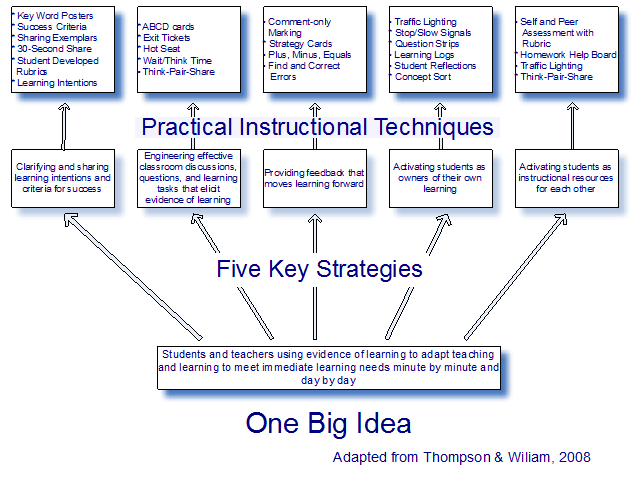 "Students and teachers using evidence of learning to adapt teaching and learning to meet immediate learning needs minute by minute and day by day"
For many of us we will be using some of these techniques as part of a usual practice, though it is worth trying and evaluating new strategies to enrich our assessment techniques. However, the effectiveness of continuous assessment comes not just from our assessment techniques but how we "adapt teaching and learning to meet immediate learning needs minute by minute and day by day" – the response to assessment. If we are using a strategy for continuous assessment, is our next task differentiated appropriate to meet the new needs of our students? Furthermore, are our students utilising reflective skills to adapt their own learning in response to that assessment?